KS Engineers, P.C. (KSE) provided construction inspection services to the New York State Thruway Authority (NYSTA) for the installation of 11 Dynamic Message Signs (DMS) and their support structures, 12 Closed Circuit Television (CCTV) cameras and their poles, 16 traffic monitoring sites, and three TRANSMIT sites, trenching and conduit, electrical lines, fiber optic cabling, and guide rail, as well as MPT, testing and calibration, and training on installed systems. The contract was expected to maintain the present system which enhances NYSTA’s ability to provide timely information to motorists. In addition, the system assists in the timely detection of incidents and improves on the time required to clear them using automated real-time travel signs. 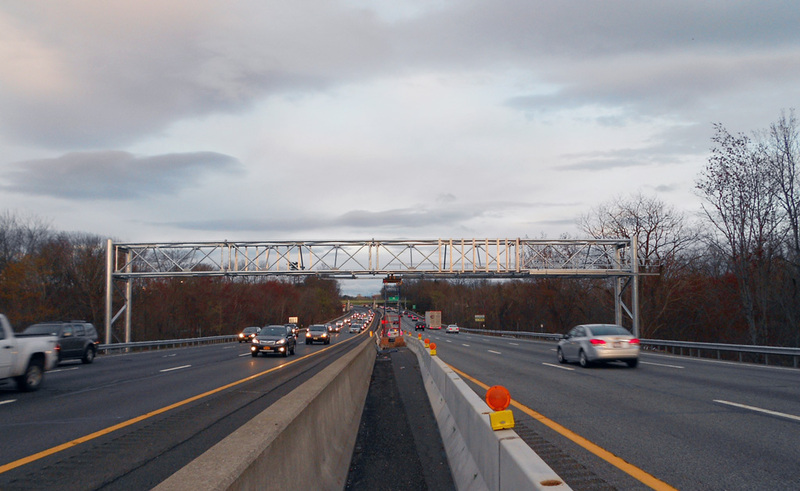 These systems are operated by NYSDOT Region 11’s Joint Traffic Management Centre (JTMC). The project scope included the following components: VMS Assembly, portable VMS (Variable Message Signs), CCTV assembly, Highway Advisory Radio (HAR) and beacon signs, detectors, a communication system, a power system, shelters and cabinets, hardware and software, TRANSMIT systems, testing and troubleshooting of system components, replacement and/or repairs of system components, adjustment and resetting of equipment, reprogramming of equipment, and any additional work As Ordered by the Engineers (AOBE).